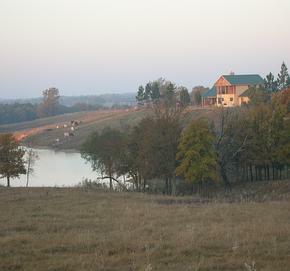 Our ranch is 270 acres of beautiful rolling hills in Southeast Oklahoma. Atoka is on Hwy 69/75 2 hours north of Dallas and 2 1/2 hours southeast of Oklahoma City. The people in Oklahoma are the nicest people you will ever meet. My husband and I moved here in 1999 and started our machine shop business and ranch. We built the home of our dreams and started raising Texas Longhorn Cattle . My husband was a bull rider and dreamed of living in Oklahoma and havng longhorn cattle. I was a horse lover and showed in about every event imaginable. I qualified for the world in working cow horse when I was 17. 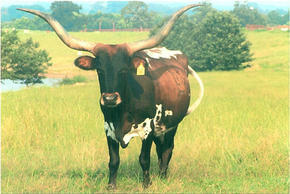 We picked the Texas Longhorn cattle because they have wonderful dispositions, are so hardy and are beautiful to look at. We enjoy them every day. We also run a few angus pairs. Our bulls include bloodlines of Tempter, Star Regard, Peacemaker, Fiesty Lee and our newest bull is by Cowboy Chex and a Hunts Command Respect cow. 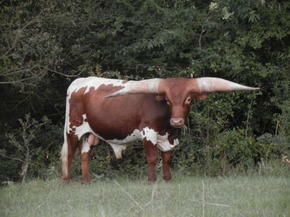 We strive for good body size, horn, color and good dispositions in our breeding program. We have cows, heifers, bulls and roping stock for sale at all times. We can accept credit cards and hold cattle with a down payment. We can also haul livestock or make arrangements for hauling long distance at a reasonable cost. Check out our website for current cattle and we sometimes have a few good ranch geldings for sale. We would love to show you our ranch and longhorn herd.